As I did last year, this year I’ll be participating in the Clarion Write-a-thon, June 24-August 4. A write-a-thon, as my intelligent readers have probably figured out, is like a walk-a-thon, but instead of giving per mile, you give per word, or whatever amount you wish. My goal is to raise $150. The Write-a-Thon has been hosted annually for the past few years by the Clarion Foundation, a wonderful organization that provides funding for the highly respected Clarion Science Fiction and Fantasy Writer’s Workshop at UCSD. It’s all for a literally fantastic cause. Clarion is the oldest writing program of its kind, and it is highly respected. Many of the greatest figures in science fiction and fantasy honed their skills and launched careers there. Check it out on the web at clarion.ucsd.edu. 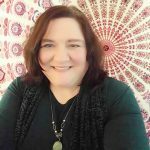 Writing programs across the nation are under tremendous financial pressure and Clarion is no exception. The Write-a-Thon’s success is vital to the workshop’s continued existence. Last year it raised $17,000. This year, I’m hoping to make a start on the first novel of my projected series about the adventures of Noora Tamarin, a young woman in Sahasra, a fantasy analog of historical India that I wrote about in a game setting for d20. It’s full of swashbuckling, steampunk-flavored adventure. My writing goal is 20,000 words during the six weeks of the Write-a-thon. Please support me in this endeavor by donating whatever amount you wish. 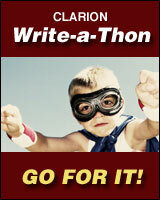 Consider participating in the Clarion Write-a-thon! As of this writing, we need 80 more writers by June 24. Thanks for your support, and if you’ve participated before, I’d love to hear about it in the comments below.